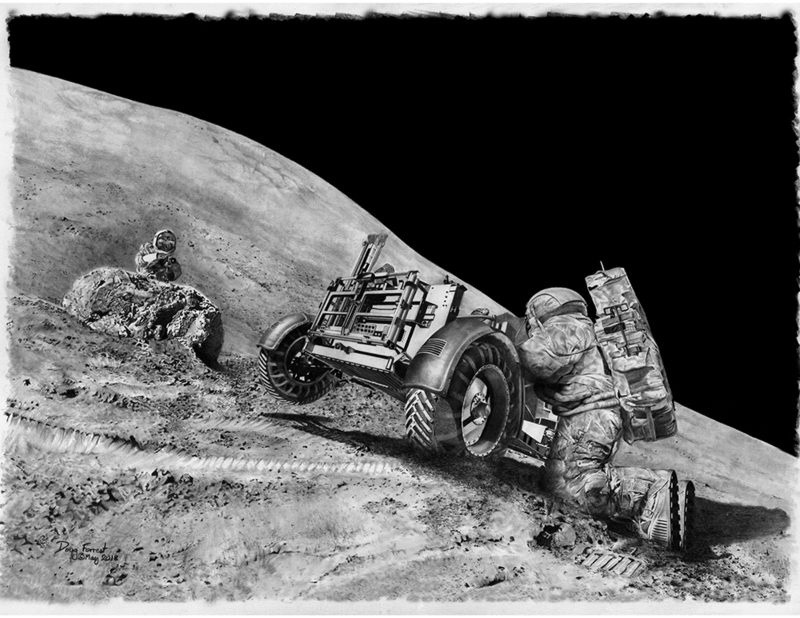 Graphite pencil on paper – The idea to do this picture came directly from Dave Scott, when I talked with him at Spacefest VIII about creating some original art. He told me the story of the green rock that they found during the second EVA and how Jim Irwin had held the LRV from slipping down the slope, while Dave sampled the rock. He strongly hinted that it would be great if I could make a new picture of this, because there were very few images from that moment in the mission and no TV transmission. I spent 6 months researching the environment from what pictures there were, as I wanted to get the landscape and hardware as accurate as possible. A year later, I was able to surprise him with the result, which he liked. It was great! This artwork is copyright © Doug Forrest. All rights reserved.